The Minimalists wrote recently about getting rid of your DVD collection, collecting things in general and hoarding, take a look at their post – (sorry, essay). For once I’m not sure I agree with some of the issues they raised. I appreciate that hoarding is bad, having lots of physical things is bad, and that my own DVD collection probably needs weeding out a bit. However there are lots of alternatives these days, you don’t need to actually buy a DVD. How about iTunes, and download it, Netflix, Film 4 DVD rental, or just borrow it from a friend. My own personal favourite is to rip some of my old DVD’s using Handbrake and then I can watch them on my Apple TV, iPad or Mac. Now this isn’t helped by copyright issues in that you can’t rip your DVD to digital format and then sell it, in fact I’m not even sure you can rip it in the first place, and here lies part of the problem with the film and music industry, but thats a whole other story. OK, so thats converting what you have, and if necessary, being in a position to have less physical stuff as a result.I completely agree with that. Collecting ‘stuff’ is not good either, and hoarding, thats worse yet. Where I disagree somewhat, is where I’m told to “get a life” if I’ve watched a film more than three or four times. Some of the films I own on DVD are classics. Star Wars, The Matrix, Four Weddings and a Funeral, Love Actually… and so the list goes on. OK, so I’m giving away my own preferences, yours are likely very different, and I’m giving away my age perhaps, and some of these films have got to be 30 years old or more, but I’ve watched them all more than four times, at lot more, and I’ll continue to do so. I’m definitely not living in the past, I’m not going back to times better, I’m not going to relive past pieces of my life, they are just good films that I like to watch, a lot ! Couldn’t agree more with this post. I love the minimalists, I even got to meet them recently (yay! ), but I think there are definitely films that fall into the rent and watch once category and films that are meant to be watched again and again. These are the films that I personally think it’s ok to keep a copy of, either digitally or even (gasp) a hard copy 🙂 Look at the the lovely tradition that’s grown up around ‘It’s A Wonderful LIfe’, and who are the weirdos who’ve only seen the Star Wars films once?! I just found your blog today through reading ‘Stuffocation’, I’m really enjoying going back through your archives and reading about minimalism from a UK perspective. 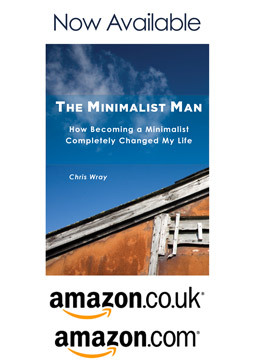 I’m in the UK myself and have been working towards becoming more minimalist for almost a year now and am loving all the positive changes it’s brought about in my life. I got rid of ALL my DVD cases and put my discs in one zip up case. I have a couple of box sets in there that I need to watch and then I think I might sell the lot! I’ve already bought a couple of movies on iTunes that I loved “The Hobbit” and “Interstellar” so far. There are lots of things on Netflix to watch, yes mostly old stuff but nonetheless great stuff. My partner and I are currently working our way through “Homeland” as we didn’t watch it the first time round. There is lots of entertainment out there for free or very cheap though. The idea of minimalism though is that you concentrate on what you LOVE, and if you LOVE certain films then why not watch them over and over, and keep the DVDs or Blurays or whatever. Remove the other clutter co you can have some space for your existing DVD collection, but then move over to purely digital with new stuff. What is it you do ?